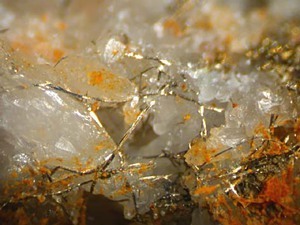 Eaglebrook mine has been known for many years as a site that has produced many fine micros, of mostly basic sulphates of lead, copper, and zinc. Please bear in mind that the site is SSSI (a site once brought to prominence by amateur collectors is now off limits to those that helped the professional institutions). The mine is quite old, worked by the Company of Mine Adventures sometime around 1700, and continued to be developed until 1722. In 1853 the mine was reopened, but it seems to have been more to sell shares than to work the mine. However, work did continue until 1865. There were other short trials until final closure in 1874-5. 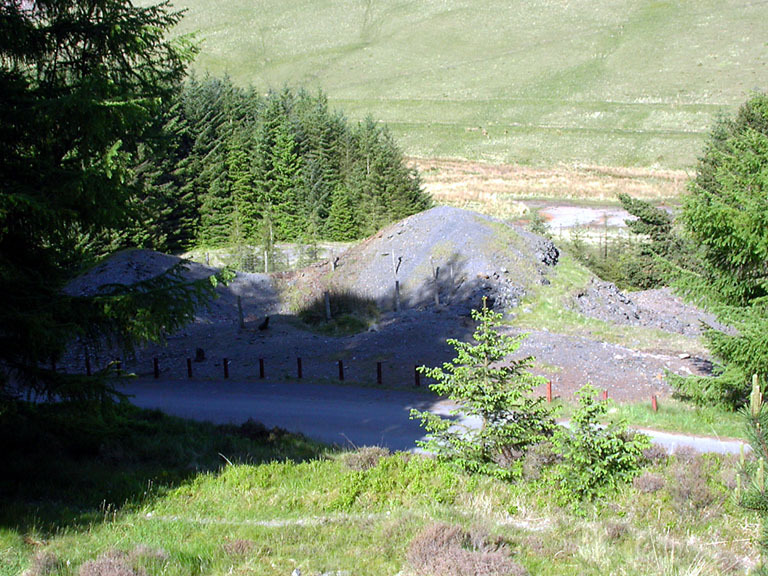 The mine was developed to a depth of 50 fathoms at the east shaft. The output is only recorded for the years after 1853, with most ore produced between 1856-59. 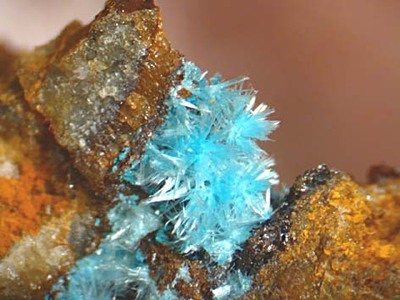 Recorded output is 598 tons of lead ore and 71 tons of copper ore. The lode extends east-west across the road with most work west of the road where there are a number of shafts and a wheelpit. Colour: Colourless, white, tinted brown. 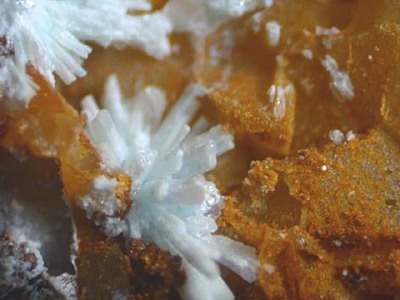 Description: Colourless xls to 1mm, associated with linarite, brochantite, cerussite, caledonite, sussannite. Description: Found as large blocks on the dumps. 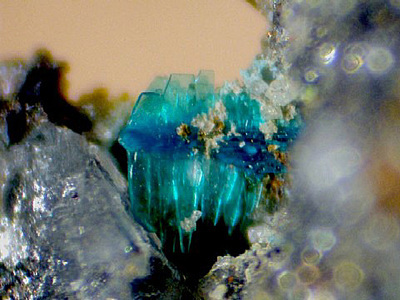 Cavites to several cms are lined with rhombic crystals to 8mm. 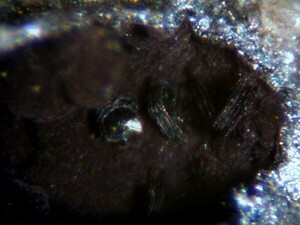 Description: Drusy crusts and single xls to 1mm (nice micros). Associated with most species. Reference: Cotterell, T.F. (2006) The first British occurrence of cesàrolite at Eaglebrook Mine, Ceulanymaesmawr, Ceredigion, Wales. 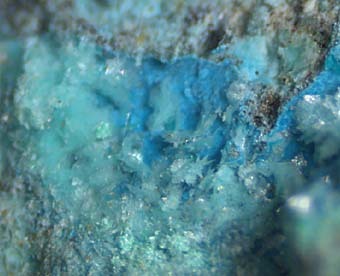 UK Journal of Mines and Minerals, 27, 36-38.; Green, D.I., Bridges, T.F., Rumsey, M.S., Leppington, C.M., and Tindle, A.G. (2008) A review of the mineralogy of the Roughton Gill Mines, Caldbeck Fells, Cumbria: Part 2 The Roughton Gill South Vein on Balliway Rigg. Journal of The Russell Society, vol. 11, 3-28. (referring to Cotterell 2006). 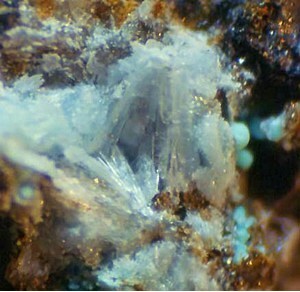 Description: Colourless to yellowish drusy crusts & vughy masses to a few cms. 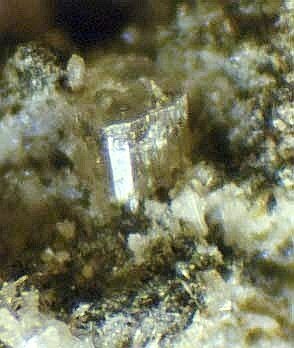 Description: Crusts of small xls to 0.7mm (nice micros), associated with many of the supergene species. 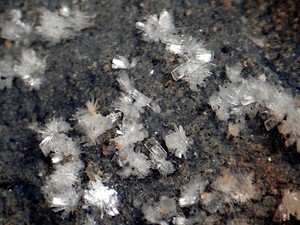 Description: Colourless to white 1cm bladed xl mass (XRD), associated with caledonite, and cerussite. Ex Steve Burchmore specimen. 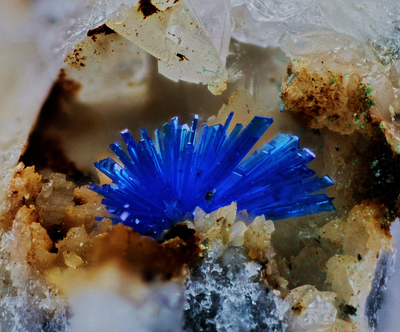 Description: Leadhillite specimens from this mine may be the polymorph susannite. 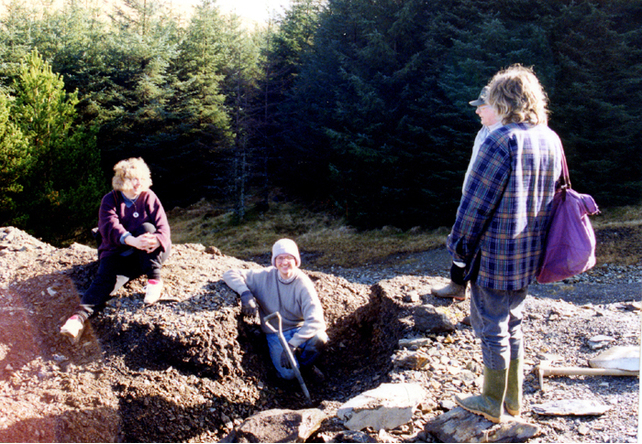 As is the case in most mid-Wales mines. Description: Deep blue to blue xls to 4mm (nice micros), associated with most othere superegene species. 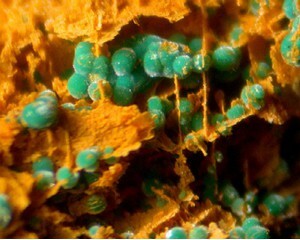 Description: Green balls & xls to 2mm+, associated with most othere species. Description: Identified by visual comparason with confirmed mattheddleite, from other mid-Wales mines, and by association. 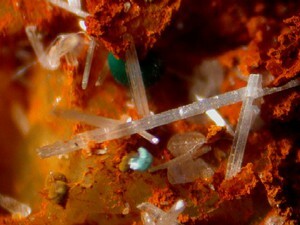 Description: Millerite is found as wire-like contorted crystals to 1cm+ in veinstone. Habit: Prismatic rods, blocky pseudocubic. 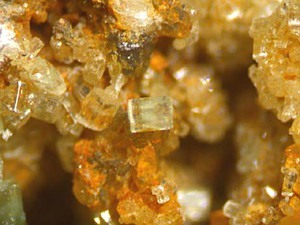 Description: Translucent tinted brown xls to 1mm, associated with cerussite. Description: Greenish xls to 0.75mm. 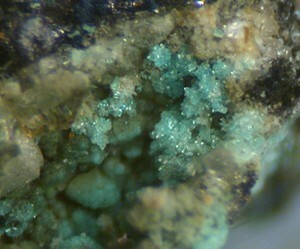 Description: Emerald green xls to 0.4mm, associated with schulenbergite, linarite, langite. Reference: S. Rust collection; Pluth, J. J., Steele, I. M., Kampf, A. R. & Green, D. I. 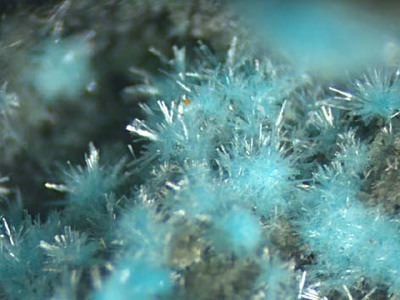 (2005): Redgillite, Cu6(OH)10(SO4)•H2O, a new mineral from Caldbeck Fells, Cumbria, England: description and crystal structure. 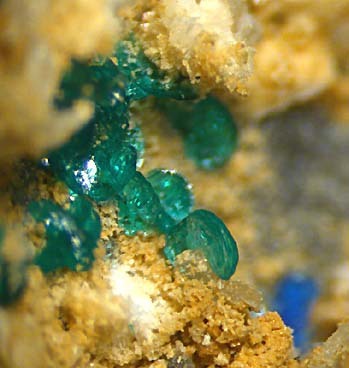 Mineralogical Magazine, 69, 973-980. 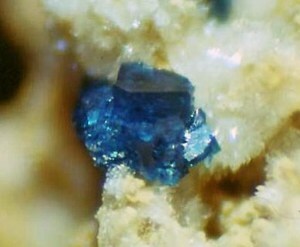 Description: Pale blue platy xl rossets to 0.4mm, associated with langite, linarite, ramsbeckite. Description: Lath like xls to 1mm in masses (nice micros), associated with most othere supergene species. 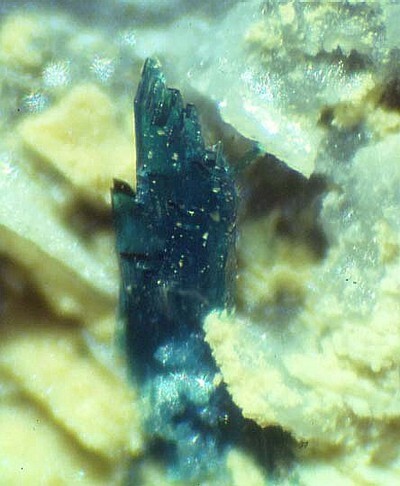 Description: Xls to 0.5mm, associated with altered galena. 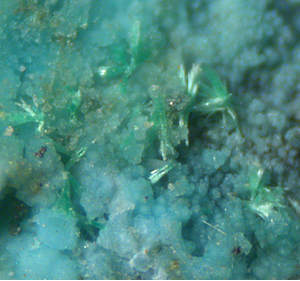 Description: Blue green platy and prismatic xls to 1.5mm (nice micros), associated with many of the supergene species. Braithwaite, R.S.W. (1982) Wroewolfeite in Britain. 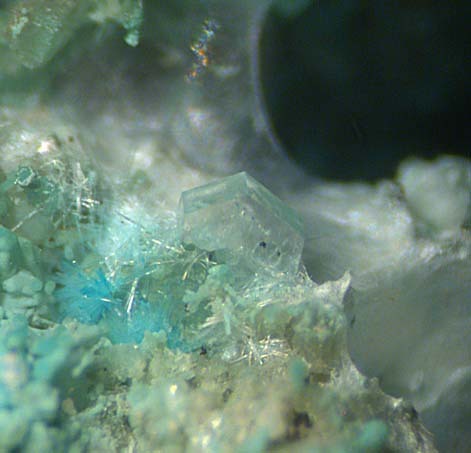 Mineralogical Record: 13 (3): 167-170, 174. Cotterell, T.F. 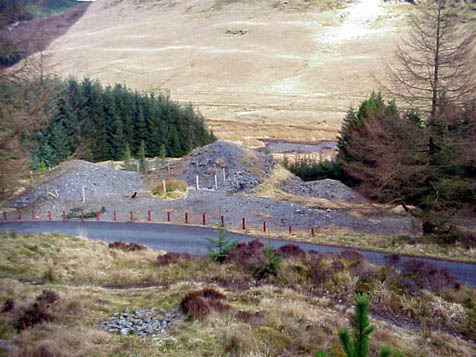 (2006) The first British occurrence of cesàrolite at Eaglebrook Mine, Ceulanymaesmawr, Ceredigion, Wales. 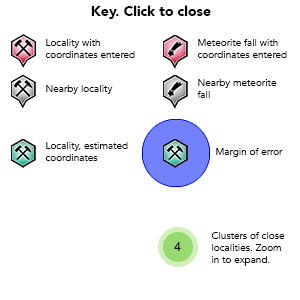 UK Journal of Mines and Minerals, 27, 36-38.